The first thing I did after recording this episode was run and tell my wife about it. Listen, we’ve had some great stories of people “doing what it takes” to take control of their life and situation, but I’m pretty sure Zach takes the prize. He has and continues to go to extremes in order to take destiny into his own hands and create the life for his family and himself. I won’t go any further than throwing out there… the next time you think, “Can I do it?”… think of Zach! There are also lots of great nuggets of wisdom in regards to just how tricky the human mind can be with emotions. You can be extremely confident that you will be able to control them, but… well… you’ll see what I mean. Let’s get to it! Today we talk to community member Zaher who goes by Zach in the community. Currently, his wife and children are located elsewhere and he wanted to find a good job to support himself and his family with the intention of being able to go back home to them. After funding a small binary options account, Zach started making some decent gains following someone else’s instructions. He is the type of person who wants to learn instead of following blindly. It soon became clear that this particular broker/educator was all a scam. Eventually, Zach realized he needed to fund a brokerage in Canada and found a discount broker. While he deals with other people’s problems and emotions daily for his day job, he thought he was the master of his emotions. This was until he finally put his hard earned money on the line day trading. He got caught immediately buying tops and selling bottoms. Zach realized that he needed a mentor after a little while of losing money. 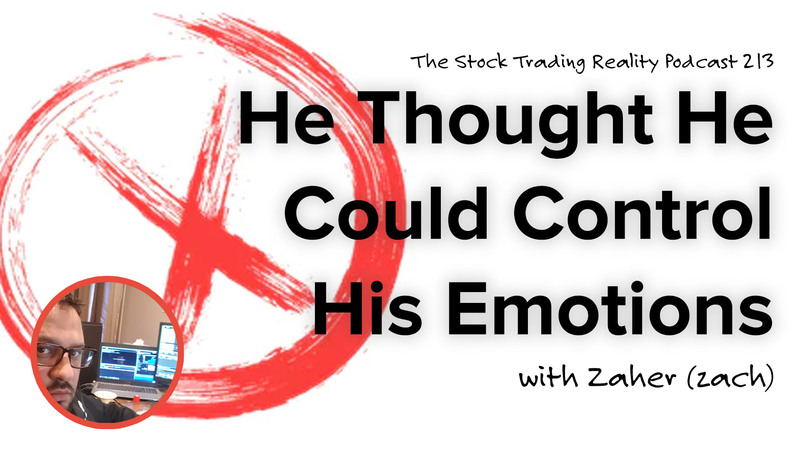 Even regardless of all the books he consumed, it was unable to help him handle the real-life stresses trading involves. After emailing 3 different trading educators, Zach ultimately decided to start taking courses here at Claytrader.com. While Zach would fly through the books earlier in his journey, he has now recognized the fact that it’s not a matter of racing to the end. Regarding the courses, he is taking his time one course at a time and rewatching material that he has trouble grasping. He understands this is not a get rich quick scheme and takes time and effort to succeed. I’m not the type of person who likes to follow anybody. I just really want to learn. I went and searched for every book that had to do with trading… and I bought them all. I’ve always thought I was a person who could control my feelings. That was until my first-day trade. 80% of my trades I’m reading it right but it’s so volatile it shakes me out right away. Then I re-enter and it shakes me out again. You helped me change. You helped me to think about things differently. I want to commit to being a really good student and I want to live with my kids. It’s been 6 years and they are growing up without me.